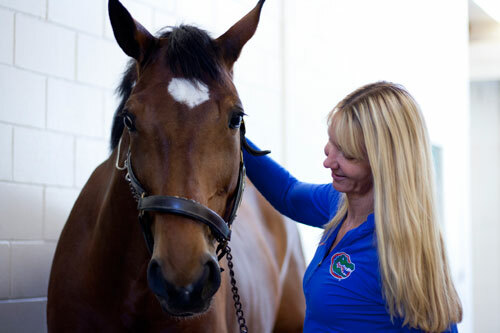 The veterinarians of the University of Florida Equine Lameness & Imaging Service specialize in the treatment and rehabilitation of poor performance in sport horses. We integrate multiple advanced diagnostic & imaging modalities, regenerative medicine, and state-of-the-art treatment techniques, including our 1.5 Tesla high-field MRI and the Lameness LocatorTM. Our wide range of modalities allows us to provide every option for care in one place. Performance evaluations can be performed in our Equine Sports Performance Complex, treadmill, or state-of-the-art hospital. Contact us to schedule an appointment or refer a client. Stem cell, platelet-rich plasma and autologous-conditioned serum therapies are forms of regenerative medicine that originate from the horse’s own body and are used to improve the healing process. Common uses for equine regenerative medicine are tendon & ligament injuries, cartilage damage, osteoarthritis, fractures and wound repair. Our veterinarians are board-certified in Veterinary Sports Medicine & Rehabilitation, Veterinary Surgery and Veterinary Radiology. This specialized team approach allows us to accurately diagnose and treat your horse’s lameness issues as accurately and thoroughly as possible.